I watched this pretty decent documentary on the Air Canada flight back from Montreal on Saturday. - How cow. Girl Talk doesn't use a mac? Microsoft lost marketing opportunity FAIL! - It's pretty awesome that a major airline like Air Canada airs a documentary that itself states that it is in violation of copyright. The movie itself doesn't have a lot new to offer folks that have listened to Lawrence Lessig's lectures or read any of Cory Doctorow's (many) pieces on the subject (both of whom appear in the doc). If you haven't, then it's a good crash course. On the down side, it doesn't do much to at least try to give perspective on the other side of the argument. Alice and Raph both pointed to this awesome, gripping story of Alice and Kev, an experiment-slash-narrative by a game design student in the UK. 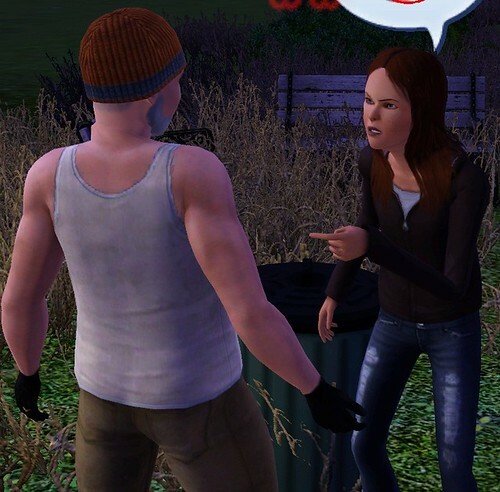 She created a homeless father and daughter in The Sims 3, took away all their wealth, and then set about letting them live their lives. Anyhow, go read it starting here. othr day, but am only getting around to blogging about it now. If you are a fan of MacLeod's, are a GapingVoid reader, and have read his How to Be Creative writing, then there's not a lot new here for you. I recommend buying it anyway. The ideas are ones that are worth revisiting and reassessing from time to time. More than that though, the book is one you'll want to share with a friend or two. If his drawings are cube grenades, then the book is an Idea Bomb. Well, another E3 behind us, and not just any E3. This was E3 born again. Following on the heels of the Supernova E3 and Dwarf Star E3, this was, I guess, the Phoenix E3? As this E3 fades, we’re left with the deluge of announcements and demos to digest. It’s an interesting thought exercise to consider which are the more significant ones. Which might have the biggest long term impact, might tip the scales in the console wars, open the market to new audiences and revenue streams, etc. There were lots of game announcements, lots of them exciting, but none so *different* as to warrant the label of ‘game changer’. There were no wild-card disruptive entrants like we saw at GDC with OnLive’s announcement. There were of course the keynotes from Microsoft, Nintendo, and Sony. Sony’s got a new handheld to continue to duke it out with Nintendo on that front, and Nintendo continues to add titles and some new capabilities to their handheld. Nothing really groundbreaking on that front. Judging from the press, most people believe that the biggest news out of E3 is that MS and Sony have played their cards on the motion control front. Microsoft with some 3D camera tech to compete with Nintendo’s Wiimote, and Sony has a wand that kind of straddles both the camera and wand camps. That is big news to be sure, but not terribly surprising. The biggest question on the motion controller front will be what it means for developers and publishers. Big budget productions necessitate cross-platform development, or at least favor it. Certainly between PS3 and Xbox360 (and PC) we see a lot of cross-platform publishing. It will be interesting to see how and if titles can map to the very different motion controls between those platforms and Nintendo’s, and whether any of them get short-changed as a result of a lowest common denominator approach. The announcement of Facebook and Twitter support within Xbox Live (Nintendo had a similar announcement around the DS, so they get some credit too). I’d posit that the fundamental promise to customers that the previous generation of consoles offered was “High quality games that Just Work”. High quality 3D games like those that were available on PC, with a console’s level of quality control and usability. I’d also claim that for the current generation of console, at least for the 360, the promise grew to “High quality games that just work *together* within a social network”. Build your network of friends who also own 360s, and get a level of experience works *between* titles. Sony and Nintendo have both played their own version of catch-up on this front, to a point. As 360’s installed base and capabilities have grown, so have the Network Effects. The utility of a network grows with its users (a function in this case of the installed base and the amount of time users spend on their 360s which is in turn a function of capabilities). Again, similar to what was available on PC years earlier (if you were using IM, Gamespy, etc), but with console level quality control and usability. Fast forward to today, and one the most significant thing we see happening on the PC is with the “walled gardens” of social networks – each of which have become platforms for software development. These social networks have realized that the same network effects that grow with customer base can hold true for their platforms and their services as well. The value of a network increases if it becomes permeable to other networks. Initially this manifests itself as the users needing to belong to both social networks, and allowing them to verify the connection between their two identies. E.g. This is my Facebook profile, this is my Flickr account and yes, you may speak to each other so that I might let my FB friends see my Flickr pics. Flickr becomes more valuable to me, and Facebook becomes more valuable to me and my friends. But this first step is still kludgy, requiring an identity on both social networks. More recently, we are seeing some of these social networks becoming sources of trusted identity credentials. Note that I can now login to Dopplr by using OpenID. I can log in to FriendFeed using OpenID, GoogleID, or my Facebook credentials. Examples exist on the forefront of gaming too. For example, Metaplace allows login with six different identity providers. If the promise of previous generations was “games that just work”, and the current that “games work with each other”, then the promise of the NEXT generation will be this: That true next-gen game platforms will comprise services that *just work* with one another. Cracking open these walled gardens is going to be difficult. Its one thing to allow the ‘linking of identities’ like we saw announced with Live/Facebook this week. Its quite another to have those services trust the identities issued by other services as the users sole credentials, especially for facets where financial transactions are concerned. It will happen though. Initially, I believe we’ll see the consoles requiring *their* identity system being a user requirement, but other more open web services allowing sign-in with these credentials. E.g. “sign in to your Flickr account using your Xbox Live credentials. This might grow to add billing-type transactions (e.g. instead of today’s creation of a separate billing relationship with Netflix, why not just ‘click here to join Netflix and have it deducted from your Xbox Live points’. While the mechanics and politics of such things will take time, the appeal of providing more paths to the cash register is strong. Most important though, will be the network effects realized. The move announced at E3 will see Xbox Live, Facebook and Twitter each becoming more valuable to customers as a result of the bridges between them. Some developers and publishers have worried about the increased power that the ‘walled garden’ platform owners might yield as these services grow to encompass everything from development to distribution. I can’t think of a better antidote to that than a realization that tearing down the walls may increase their value. It will take a long time for this to happen, but this year’s E3 marked an important first step. Edison - His Life and Inventions , was written in 1910 by Thomas Commerford Martin (with a co-author, F.L. Dyer), a long-time Edison engineer employee and all-round fanboy. Note that the book is in the public domain, so you can get it here in e-form or at the previous link for a print version. I actually consumed it in audio book form, in an 'abridged' series of 25 podcasts of about 40 minutes each, for the first 25 chapters, and remaining 4 chapters in text form online. You can find the audio version here, done as part of the excellent Story Speiler Podcast. This is not the easiest book to get through, even in audio form. It's sixteen hour length being only one of the reasons. Being written in 1910, the style in which its written takes a little getting used to and takes a while getting to the point. At the same time, I found this entertaining as well. The hardest thing about it is that Martin & Dyer's fandom rivals that of all but the most die-hard religious zealots. It's tough to cut through the walks-on-water BS and to what the truth might be. This aside, it's a *really* interesting read. Most people are familiar with the stories around Edison's incandescent bulb and phonograph. However, the details around these are interesting unto themselves and are lost in the high-level story. For example, the fact that over a decade elapsed between the first success with the light bulb and reaching a point of commercial viability (lowering cost, increasing life, etc, over that time). It's also interesting in covering how many other enterprises Edison was involved in and covering some of the details around them. He had a hand at mining, cement making, housing construction, electric railways, the stock ticker, and more. There are a lot of interesting historical lessons to get out of this read, all involving disruptive technology and business models. They are so far removed from our current time and technology that it makes for interesting contrast, and the metaphors with current day are many. I'd recommend the audio version for someone that enjoys audio books on a regular commute, as it'll take you a while to get through. Wow did I enjoy this little gem of a book. A friend loaned it to me *months* ago (sorry Pete!) but it got lost in a pile of books somewhere and I only found it recently and got to it. Once started I tore through it pretty quick. It is the story of the Longitude prize, the sixteenth century equivalent of the X-Prize, a handsome award offered by the British government to whomever could solve the problem of longitudinal location for purposes of sea navigation. For years people were able to calculate their latitude by comparing the angle of the north star to the horizon, but latitude – figuring out their east-west position on the globe - was a far harder problem, and people at sea that couldn’t calculate their location tended to also to do things like run into rocks and cease floating. ted his life – or at least 31 years of it, to the building of 4 clocks, the fourth of which would eventually win this prize, conquering the astronomers, changing the state of the art of chronometer making. In solving the problem, Harrison changed the ability of the British Navy to navigate the globe, and in doing so, its no exaggeration to say that he changed the course of history. Despite this, it took him years to get the acknowledgement, as the book details the many years his efforts were thwarted for reasons of politics and greed. Those looking for good business analogies will find a good metaphor for resistance to innovative approaches in the face of an assumed/established direction. (The clockmakers were regarded as 'mechanics' and the whole practice as folly by many of the astronomers, who beleived that like the north star's use for latitude, the answer lay in the clockwork of the heavens. Amongst the coolest things I learned in this book is that of the 4 clocks he built, all four of which are located in the National Maritime Museum in Greenwich, England, three of them are still running today. Quietly ticking away, tended to only with a daily winding and occasional cleaning, almost 300 years after their construction. How awesome is that!? That museum is now on my list of must-see places.